This story was first published in the 2015 edition of the Algoma Travel Guide. Story and photos by Virgil Knapp. The ‘Planet D’ is a travel and adventure couple comprised of Dave and Deb based out of Toronto. They spend much of the year traveling the globe while blogging about it to one of the largest following’s in the business. All the while bringing a very down to earth attitude, showing they are just normal people with a sense for adventure. The summer of 2014 was a busy one for me, with much of my shooting days dedicated to chasing around Dave and Deb from ‘The Planet D’ as they trained for one of the great touring rides in Northern Ontario; The Lake Superior Circle Tour. This ride is considered a challenge for even the most experienced riders and The Planet D would be tacking the 2100km loop with little more then 4 months experience under their belts. Why take on such a challenge you ask? Ontario Tourism (partnered with Honda Canada and Motorsoul Rider Training Schools) set out to prove it’s possible to take complete novice’s, supplying them with proper training and equipment and produce fully competent touring riders in less then one full riding season. With much of April to June dedicated to training and smaller single day or weekend rides, the big moment was finally here and we set out to tackle The Lake Superior Circle Tour. With seven days allotted to complete the trip, we’d have to stick to a tight schedule and hope the weather co-operated! We chose to start the tour on the U.S side traveling in a northwest direction through Michigan, Wisconsin and Minnesota. We saved the beauty of Algoma Country’s stunning rock cliffs and meandering roads snaking along Superior’s north shores for the latter half of the journey. This was my second time photographing motorcycles on this section of the lake and the beauty never ceases to amaze me. 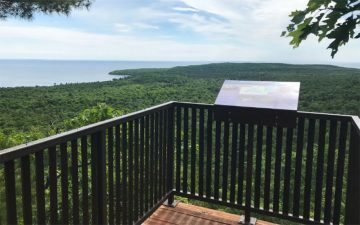 We pulled off at a well-known lookout in Agawa Bay with a 180-degree panoramic view, deep blue water as far as the eye can see and the best way to describe it was humbling. I took shots of Dave and Deb making passes with this stunning backdrop and thought to my self, “I can’t believe were in Ontario”. As we traveled southeast along Highway 17 headed for our final destination of Sault Ste. Marie, we stayed in motorcycle friendly towns such as Terrace Bay, Wawa and Batchawana Bay to name a few. All were accommodating to us and offered hospitality like only the North knows how to do. We arrived in Sault Ste. Marie just in time for Dave and Deb’s press conference at The Bush Plane Heritage Museum, complete with a rock-star entrance Dave and Deb rolled up to the podium on their bikes in full riding gear, ready to greet the media. As they shared their experience of the last seven days you could really hear the passion for riding was genuine. After all they had accomplished something very few people have before them, proving that this experiment was a success and it is possible for any of you reading this to do the same. If you’ve been considering getting your license, or planning a motorcycle trip now’s the time to do it! 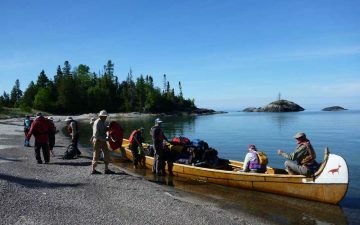 The next big adventure awaits you in Algoma Country.